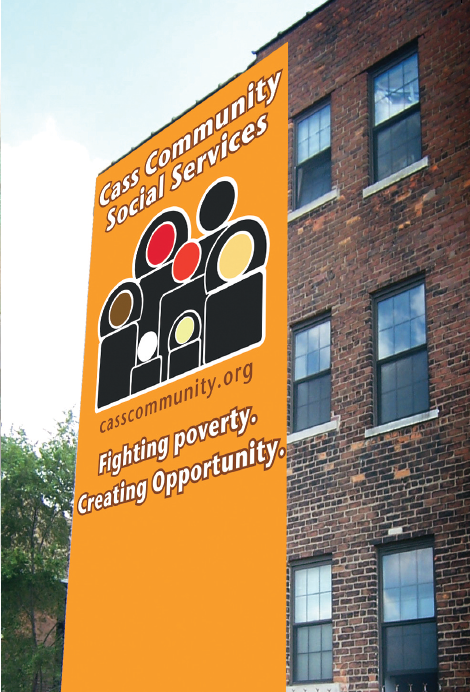 Cass Community Social Services (CCSS) was established as a nonprofit 501 (c) (3) in 2002. Prior to that many of its programs started as a part of Cass Community United Methodist Church. The Detroit-based agency works across the city in areas of concentrated poverty providing programs for food, health, housing and jobs. CCSS prepares and serves 700,000 meals annually. 300 homeless men, women and children currently stay in one of CCSS’ shelters or permanent supportive housing programs. CCSS operates two weekly free medical clinics and a day program for 125 adults with developmental disabilities. 80 adults are currently employed in the agency’s Green Industries which marry jobs with sustainability. The Skill Building, Cass Apartments (Antisdel & Brady) and Cass House programs are CARF accredited. For more information on CARF accreditation please contact Kim Hudolin. I am interested in learning more about your non- profit and the good you do in the community. Thank you for all the good works being done to help those in need. As a member of a few artist groups, wonder if you would be interested in donated art to adorn the homes of the new residents? I think it’s amazing what you guys are doing in Detroit!!! Empty lots are feasible opportunities for growth!! I love what you’re doing with them. If this happened in Atlanta, I would save tons of money!! I’m very interested in having one myself!! Please keep me posted, I am genuinely interested in your programs. Am interested in working with you in your programs that you are doing to the community.Good work keep up. Applications have been closed for some time now. We do not anticipate opening them again. I thank God for Reverend Faith Fowler and her nonprofit ministry helping God’s people and enabling them to live better and meaningful life’s. May God Bless and always keep you Reverend Fowler. Sincerely, Barbara Jo Martin. My name is Jason Haugen. I live in Las Vegas NV. We have an enormous amount of needy single people, families with children, vets and a homeless population that grows more out of control everyday. I would love to start a non-profit to build tiny homes, or maybe even an expantion of your group, here in Vegas and copy your success. However I do not know where to start. Could you help me? Would you please email me some information and some advice of where and how to get started? Thank you so much for your time.